HomeGold IRA BlogBuy GoldWhere Will The Economy Head If We Go To War With North Korea? Where Will The Economy Head If We Go To War With North Korea? The United States doesn’t want a second installment of the Korean War, but what would happen to the domestic and world economy if fighting were to occur? 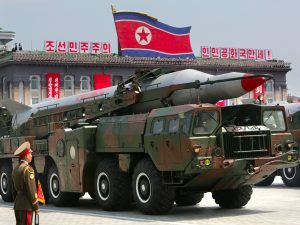 Though political rhetoric around the North Korean crisis has been dialed up to an 11 via social media, the 24-hour news cycle, and other sources of information, few analysts actually think the US will engage in all-out warfare with the Hermit Nation. But if the US does take military action against North Korea, what will happen to the domestic and global economy as a result? One thing is certain – the stock market won’t know what hit it. Let’s look at four potential key players in the North Korea crisis – the US, China, South Korea and Japan. Each nation would see significant economic impacts from a military reaction to North Korea. The United States: The US doesn’t want another war, and between what seems like continual fighting in the Middle East and a potential conflict on the Korean Peninsula, our equities markets will likely take a beating. The price of historically-stable assets, like precious metals, will soar as a result. Consumer confidence in the US will likely drop, too, as more people flock to durable goods and minimize cash outlays on discretionary purchases. This may have a serious ripple effect throughout the retail sector. The cost of war alone could be crippling – we’ve spent more than $5 trillion over the past 15 years between conflicts in Iraq and Afghanistan. China: As tensions rise between China (North Korea’s biggest trading partner) and the US, the Chinese equities markets will decline and that will send a message of instability to emerging Asian markets. Trade in the area, both entering and leaving the nation of China, could be disrupted as a result of fighting in the area, and South Korea would be less apt to trade with a nation that is directly supporting an enemy state to the North. South Korea: Unfortunately, the real loss here will be measured in human casualties – not on the stock market ticker. That said, there will be a massive and overwhelming shock to South Korean businesses, financial markets, infrastructure and hard assets as a result of war. Consumers will demonstrate substantially reduced confidence, and the nation will be forced to spend billions of dollars to defend itself from attacks from the North. Credit markets will falter, and defaults will rise precipitously. South Korea may be reduced to rubble in the event of a conflict with the North. Japan: As one of our staunchest allies in the Pacific, Japan finds itself aligned with us at a time when North Korea considers our allies their enemies. Japan’s geographic location puts the crosshairs right between their eyes, and North Korean missiles have already been fired over the island nation in a daring show of force. If war does break out, expect a sharp sell-off in Japanese equities, a rapid decline in consumer confidence, and a reduction in domestic demand. Japan already suffers from a relatively unstable economy – war could force serious regressions to their fragile system. War with North Korea is not likely to happen, but if it does the economic ramifications could be severe. The global equities markets could see serious and long-lasting losses, while traditional hedges like precious metals could see a rapid rise in valuation. Let’s hope that cooler heads prevail.